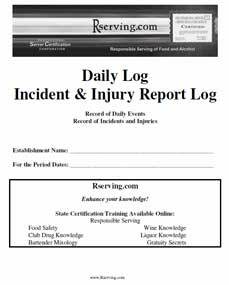 Yearly Incident Report Log, only $19.95! This incident and injury report log book is a bound document that has a daily section for notes, and reference pages to help the server write daily notes, and refer to the specific information pages. The specific information pages have a quick format, so the server can circle the needed information, for use later. Injuries are the main reason for lawsuits, hence you will want a record of what happened. Click to learn more and order, price includes shipping! The Bartender's Training Manual and Recipe Guide includes Bar Terms, Speed Drills, Commercial Drink Recipes, Garnish Guide, Wine Guide, and alcohol knowledge information, such as references for Scotch, Irish, and other whiskey, as well as details of Vodka, Rum, Gin, Tequila and other alcohols. 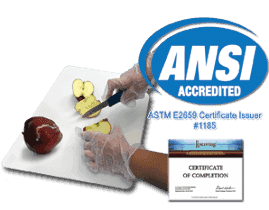 Click to learn more and order, price includes shipping. 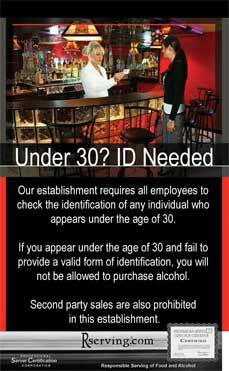 The Rserving® "Under 30? ID Needed" posters. They are perfect for the entrance of your establishment. Size 8" x 13". 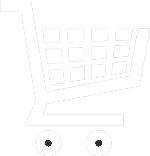 Click to learn more and order, price includes shipping!